Context: Low energy electron beam has been being used widely for superficial cancer treatments. In the current study a design for production of very low energy electron beam, by different thickness of Perspex spoilers, is presented that may be used for skin cancer. Aims: MCNPX Monte Carlo code was used for modeling and simulations in the current study. An energy spoiler Perspex was modeled for degrading 4 MeV electron beam of Varian 2300 CD Linac. Materials and Methods: The thicknesses of 3, 7, and 10 mm were applied before electron applicator at a distance of 42 cm from phantom surface. Dosimetric properties of new electron beams including Rp, Dmax, E0, as well as the penumbra of the beam were investigated. Results: For the 3 mm spoiler, the superficial beam output decreased to 77%, and the Dmax, R90, R50, and RP were shifted to the depths of 4, 6, 9, and 12 mm, respectively. While for 10 mm filter the results were 5.2, 3.0 and 5.0 mm for R90, R50, and Rp, respectively. In addition, the surface dose was 93% and the Dmax was shifted to the depth of 1mm for the 10mm Perspex spoiler slab. Conclusions: The presented beam provides a novel surface dose, Dmax, and RP which can be applicable for treatment of skin cancers with minimum dose to the beyond normal tissues. Radiotherapy plays an important role in the management of appropriately selected skin carcinomas. Tumors of the eyelid, nose, and ear can be treated successfully with the preservation of adjacent normal tissues with electron beam. Furthermore, tumors located in the embryologic fusion plates of the face can be irradiated with wide margins, either as primary or postoperative therapy. 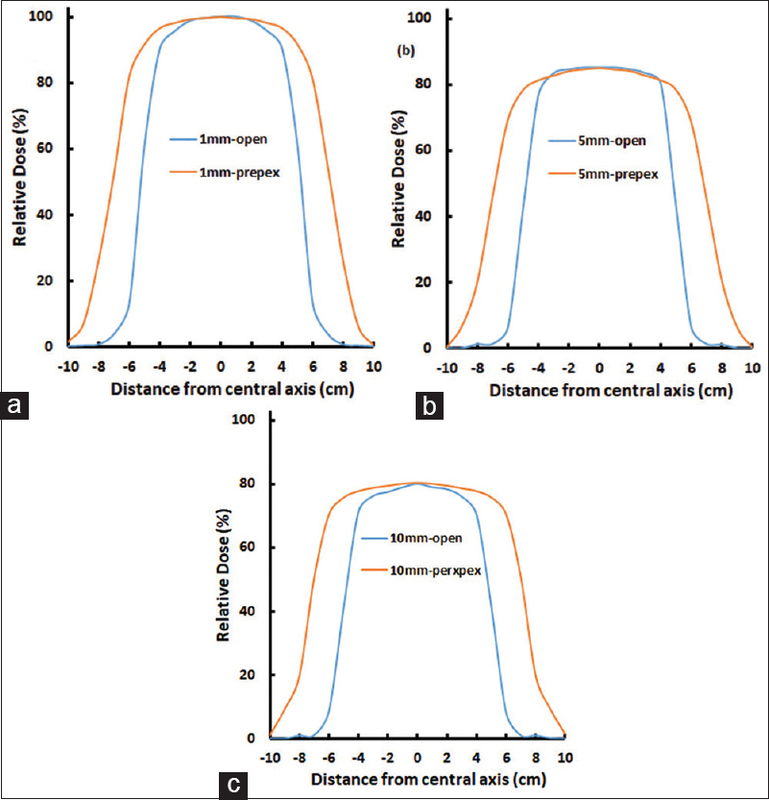 Treatment planning for superficial tumors using electron beam is made based on optimum energy selection, proper isodose coverage of planning target volume (85%–90%), and limitation of normal organ received dose. For the lowest energy of electron beam in linear accelerators (LINACs), i.e., 4 MeV, the Dmax is higher than 4 mm, and therefore, it is not suitable for all types of superficial cancers. However, by degrading the electron energy, and corresponding Dmax, the beam spoiler can overcome this limitation. The depth and surface dose of electron beams can be modified by placing a beam spoiler in the beam path. In general, the surface dose is a function of electron energy, source-to-surface distance (SSD), field size, thickness of beam spoiler, distance of beam spoiler from surface, atomic number of beam spoiler, and angle of the beam. The effects of these parameters on the surface dose, bremsstrahlung dose, and field size changes for small fields are evaluated by Das et al. at standard SSD and the electron energies from 6 to 17 MeV. 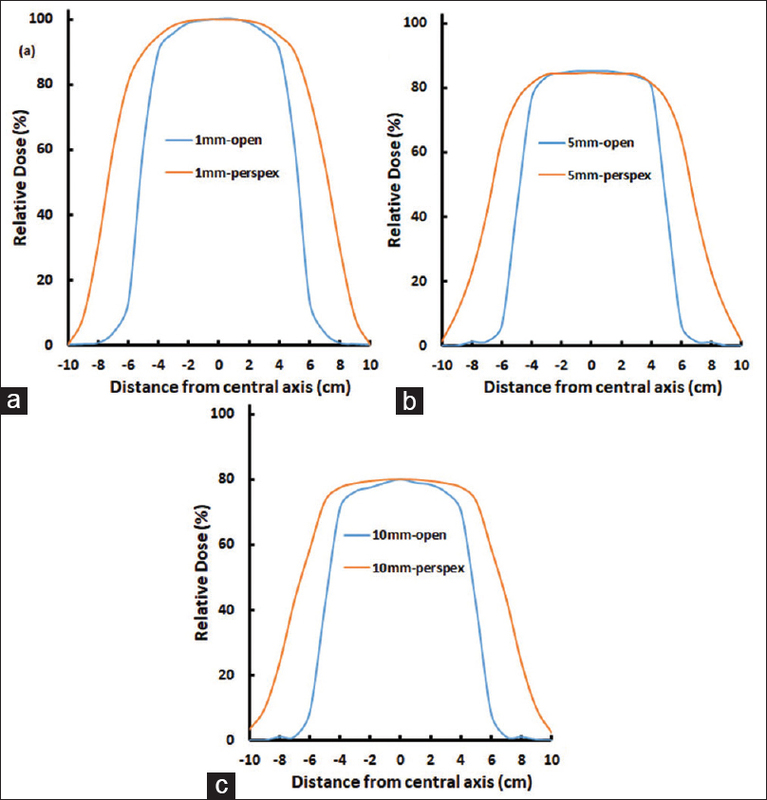 They found that the use of a beam spoiler can generally increase the surface dose to values exceeding 90% while maintaining a bremsstrahlung dose <3%. In addition, changes in the field size due to the placement of the beam spoiler were considerable in some cases. In another study, they used Al, Ti, Cu, and Pb foils to increase the surface dose by the electron contaminations. Similarly, some studies showed that the usage of an electron spoiler, a 4-mm aluminum foil, located at the end of the electron applicator can provide better dose distribution for superficial tumors treated by a 6 MeV electron beam. The results showed that the spoiler had reduced the practical range (Rp) and increased surface and build-up doses, but it also significantly widened the penumbra. Therefore, the feasibility of using a low-energy electron beam with a metallic foil spoiler for treating skin cancers was demonstrated. The method is hygienic and avoids some of the disadvantages associated with the bolus technique, but it is valid only for flat surfaces and perpendicular incidence. In another study, a technique was developed by inserting an acrylic plate in the tray of rotational total skin electron therapy, to deliver a lower energy electron and change in percentage depth dose (PDD) for a 6 MeV electron beam on a Varian 21EX. They found that the E0 decreases as the plate thickness increases. Despite the investigations on the parameters which are mentioned in the above studies, there is no study performed for presenting an optimum thickness of acrylic (Perspex) spoiler to treat skin cancer. Such spoiler should reduce the electron beam's Dmax to the range of 1–2 mm. Therefore, we prepared three different thicknesses of acrylic spoilers by MCNPX code to obtain the suitable Dmax for treating the skin cancer. This decrease in the Dmax associated with keeping the normal tissues beyond of the skin safer. In addition, in comparison with the literature, the background X-ray was lesser. The head of Varian LINAC CD 2300 and a water phantom with dimension of 50 cm × 50 × cm 50 cm was simulated using MCNPX Monte Carlo (MC) code. [Figure 1] shows the simulation of the LINAC head by MCNP. The 4 MeV electron beam and its applicator for a field size of 10 cm × 10 cm (SSD = 100 cm) were also simulated., To degrade the electron energy, three hydrocarbon layers with a low atomic number, called Perspex, were used (C5O2H8, density = 1.18 g/cm2). Because of the low atomic number elements of Perspex, the produced bremsstrahlung rays are less than the materials with high atomic number which used in some literature., These layers were 3-, 7-, and 10-mm Perspex spoilers where placed on the electron applicator at a distance of 42 cm from phantom surface. First, the beam data for 4 MeV electron beam were measured using ionization chamber, Markus (Model 23343, PTW, Freiburg) and MP3 water phantom (PTW, Freiburg). Simulation of electron beam exiting from the bending magnet was made. Consequently, a conical opening of primary collimators with a thickness of 6 cm made of tungsten was considered. Primary scattering foil with a radius of 1.125 cm and secondary scattering foil with 2.25 cm in radius made from tantalum and aluminum, respectively, were simulated. Secondary collimators consisting of X and Y jaws with a thickness of 7.78 cm made of tungsten were modeled. A desktop computer with the Athlon 3800 CPU was used for all simulations. 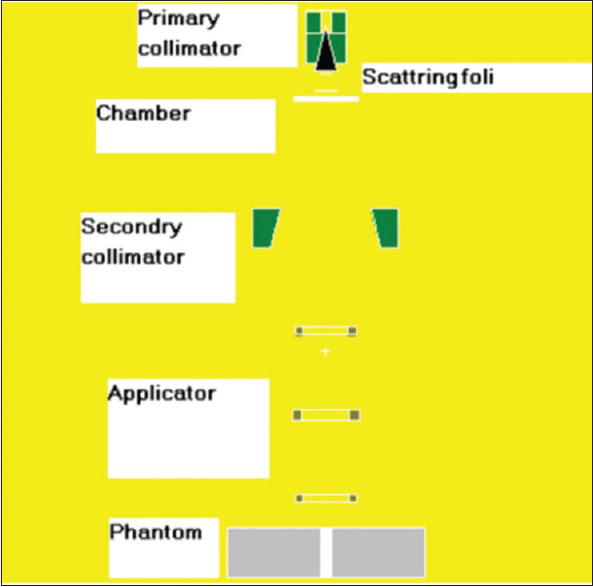 To calculate the absorbed dose from electron beam, the water phantom was divided by 2 mm × 2 mm × 2 mm cells as dosimeters. The absorbed dose was calculated using *F8 Tally in each cell. This tally scores absorbed dose in every cell in terms of MeV, which must be divided to the water mass to give us the absorbed dose. The statistical uncertainty of <3% was considered for all dose calculations. The number of simulated primary electrons was 4 × 108 and the time of run was about 6700 min. Beam profile curves at the depths of 1, 2, 3, 4, 5, 10, and 15 mm and at the distance of −10 to +10 cm from central axis were drawn. Further, the PDD at the central axis from depth of 0–100 mm was obtained. Parameters for primary electron beam including average energy of 4 MeV, energy distribution (Gaussian), and radial distribution of 2 mm were used. 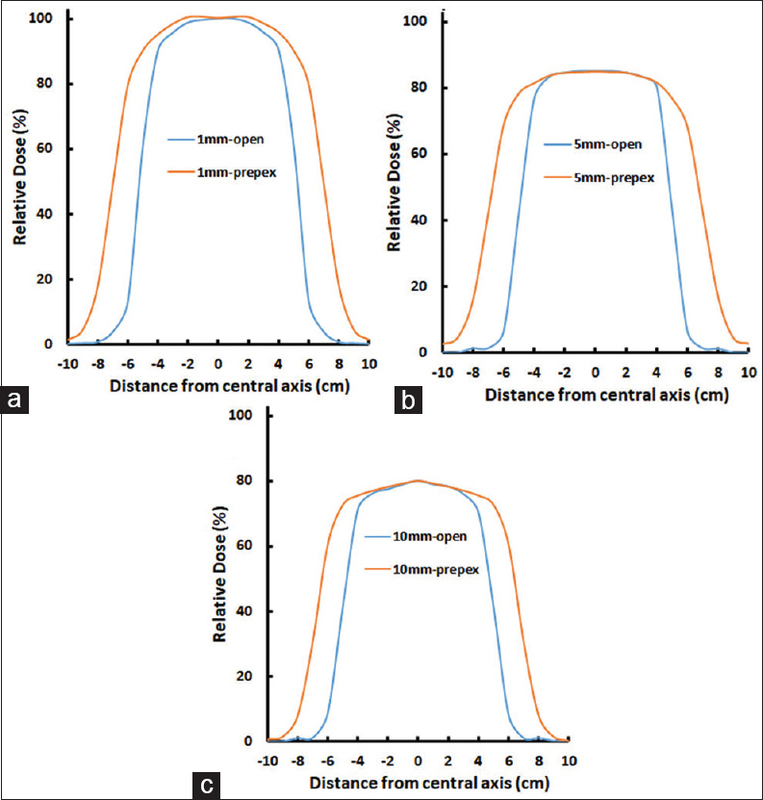 The distance between the point of 20% dose and 80% dose on the profile curve was considered as penumbra which was addressed in both measurement and calculations. For validating the design, beam profiles at a depth of 1, 5, and 10 mm and the PDD were compared with the measurement [Figure 2] and [Figure 3]. There was a good agreement (<3% for beam profiles at different depths and depth doses) between measurement and MC results. 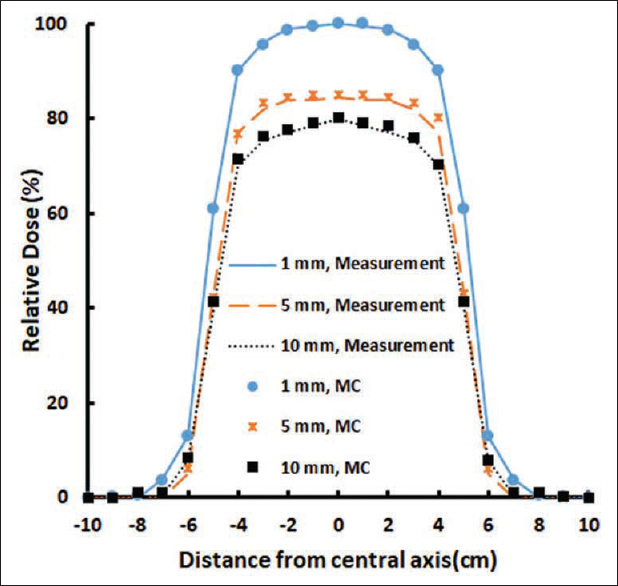 For MC model of conventional 4 MeV electron beam, surface dose (D0) was 74.5% and the ranges of R50 and R90 were 11.5 and 8.1 mm, respectively. Consequently, the differences between MC and measurements for R50 and R90 were 0.24% and 1.19%, respectively. In addition, the respective differences between the positions of Dmax, D0 obtained from measurement and MC were 0.91% and 0.5%. C1 = 0.22 MeV, C2 = 1.98 MeV/cm, and C3 = 0.0025 MeV/cm2. For the 3-mm Perspex spoiler, superficial dose slightly increased and reached to 77%. In addition, as illustrated in [Figure 4], the penumbra was increased as well. The Dmax, R90, R50, and Rp were reduced to 4, 6, 9, and 12 mm, respectively [Figure 5]. Furthermore, E0 and mean energy (Emean) were 2.96 and 2.16 MeV, respectively. For all studied Perspex thicknesses, the field size and penumbra (20%–80%) derived from MC calculations for beam profiles at the depths of 1–5, 10, and 15 mm are tabulated in [Table 1]. As it can be seen, the field size is decreased by increasing the calculation depth, but the penumbra remains constant. 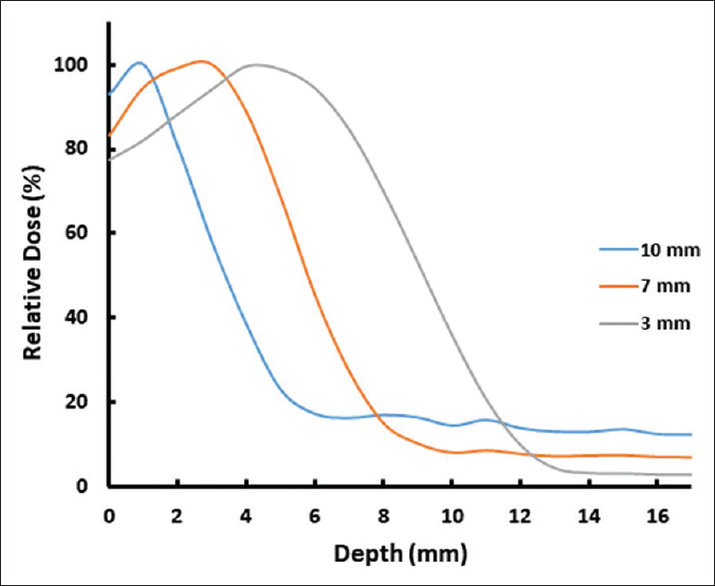 For thickness of 7 and 10 mm, the profiles are presented in [Figure 6] and [Figure 7], respectively. In PDD measurement, the surface dose increased to 83% and Dmax decreased to 3 mm. In addition, Dmax, R90, R50, and RP have reached to 3, 4, 6, and 8 mm, respectively. Moreover, mean energy (E0) and most probable energy were 1.92 and 1.80 MeV, respectively. The results obtained from profile are shown in [Table 2]. As it can be observed from [Table 1], [Table 2], [Table 3], the field size and penumbra were increased by depth. For the 10-mm Perspex spoiler, the surface dose increased to 93% and Dmax decreased to 1 mm. Furthermore, Dmax, R90, R50, and RP were 1, 2, 3, and 5 mm, respectively. Moreover, E0 was 1.21 MeV and Emean reached to 1.2 MeV. The results showed that the field size decreased by depth. However, penumbra increased significantly by depth which can be explained by the fact that the electron energy is decreased by depth and at the same time the scattering of electrons is increased. 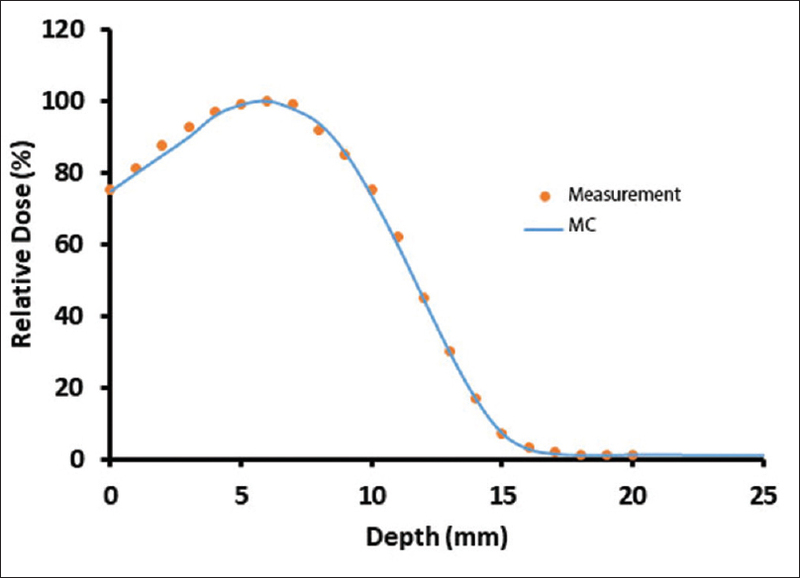 Comparing the MC calculated beam profiles, it can be concluded that field size and penumbra are increased by increasing the Perspex thickness. With increasing the Perspex thickness, the energy of electrons is lowered, and consequently, the probability of scattering in lateral direction is increased. Therefore, the Dmax is brought to a shallower depth compared with the open beam. The presented results in the current study are consistent with the results of literature, showing that increasing the thickness of the spoilers increases the surface dose and enlarge the field size.,, However, other studies did not investigate a suitable spoiler for treatment of very shallow malignancies such as skin cancer, which the surface dose and Dmax should be adjusted on maximum 2 mm. In contrast to the literatures' methodologies and results, due to the low depth (3 mm) of R50, the presented 10-mm Perspex spoiler makes the ability to treat skin cancer without delivering high doses to beyond tissues. Furthermore, in accordance with the investigation of Pavón et al., E0 decreased with increasing spoiler thickness. Electron beams produced by medical LINAC are contaminated by bremsstrahlung X-rays due their interaction with various components of accelerator head. The metallic foil in some studies leads to high contamination of bremsstrahlung X-ray; however, since Perspex chemical composition is defined as C5O2H8, a dominant bremsstrahlung production of 0.075 MeV was obtained. It means that per every electron with the energy of 4 MeV energy collided by Perspex layers, a photon with energy of 0.075 MeV is created. It can be concluded from simulations that Dmax becomes closer to phantom surface and beam penumbra was extended by adding Perplex layers on 4 MeV electron beam. Moreover, due to shallow Dmax and high-dose gradient of the 10-mm Perspex spoiler electron beam, it can be used to deliver maximum dose to skin and minimized practical range spares the normal tissues. However, adding the Perspex to electron beam falls the output of the LINAC. We would like to thank the Talented Young Scientist Program (TYSP), China Science and Technology Exchange Center for their support (No. P160U4908). This work is also supported by the National Natural Science Foundation of China under Grant Nos 1137504 and 11005019. The study was supported by MSc Thesis Fund. Radiation Therapy for Skin Cancer. Cognetta AB, Mendenhall WM, eds. New York, NY: Springer, 2013. p. 251. Morrison WH, Garden AS, Ang KK. Radiation therapy for nonmelanoma skin carcinomas. Clin Plast Surg 1997;24:719-29. Khan FM, Williamson JF, Sewchand W, Kim TH. Basic data for dosage calculation and compensation. Int J Radiat Oncol Biol Phys 1980;6:745-51. Das IJ, Kase KR, Copeland JF, Fitzgerald TJ. Electron beam modifications for the treatment of superficial malignancies. Int J Radiat Oncol Biol Phys 1991;21:1627-34. Das IJ, Cheng CW, Mitra RK, Kassaee A, Tochner Z, Solin LJ, et al. Transmission and dose perturbations with high-Z materials in clinical electron beams. Med Phys 2004;31:3213-21. Hernández V, Sánchez-Reyes A, Badal A, Vila A, Mur E, Pedro A, et al. Use of an electron spoiler for radiation treatment of surface skin diseases. Clin Transl Oncol 2010;12:374-80. Xu M. SU-E-T-329: Degrading electron beam energy in rotational total skin electron therapy. Med Phys 2011;38(6 Pt 15):3563. Khaledi N, Sardari D, Mohammadi M, Ameri A, Reynaert N. Dosimetric evaluation of a novel electron–photon mixed beam, produced by a medical linear accelerator. Journal of Radiotherapy in Practice. 2018;17:319-31. DOI: https://doi.org/10.1017/S1460396917000711. Khaledi N, Arbabi A, Sardari D, Mohammadi M, Ameri A. Simultaneous production of mixed electron – Photon beam in a medical LINAC: A feasibility study. Phys Med 2015;31:391-7. Glide-Hurst C, Bellon M, Foster R, Altunbas C, Speiser M, Altman M, et al. Commissioning of the Varian trueBeam linear accelerator: A multi-institutional study. Med Phys 2013;40:031719. Doi: 10.1118/1.4790563. Khaledi N, Aghamiri MR, Aslian H, Ameri A. Tabulated square-shaped source model for linear accelerator electron beam simulation. J Cancer Res Ther 2017;13:69-79. Pavón EC, Sánchez-Doblado F, Leal A, Capote R, Lagares JI, Perucha M, et al. Total skin electron therapy treatment verification: Monte Carlo simulation and beam characteristics of large non-standard electron fields. Phys Med Biol 2003;48:2783-96.